Relyence Maintainability Prediction computes all your most vital maintenance and repair metrics. 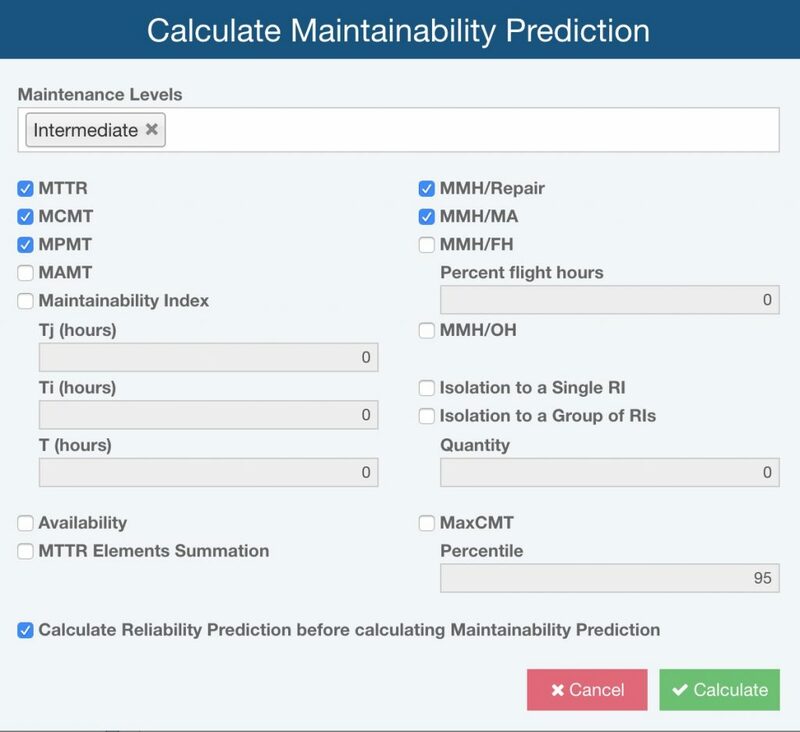 Relyence Maintainability Prediction calculates all your most critical metrics for evaluating your repair and maintenance related activities: MTTR (Mean Time to Repair), MCMT (Mean Corrective Maintenance Time), MPMT (Mean Preventive Maintenance Time), and much more. Based on the MIL-HDBK-472 standard, Relyence Maintainability Prediction enables you to optimally design your maintenance procedures. Relyence Maintainability Prediction computes a wide range of metrics. Individual MTTR Element Values: The summation of the results associated with Preparation, Fault Isolation, Disassembly, Interchange, Reassembly, Alignment, Checkout, and Start Up. Relyence Maintainability Prediction supports the MIL-HDBK-472 standard including procedures 2, 5A, and 5B. Procedure 2 predictions evaluate the corrective, preventive, and active maintenance parameters of electromechanical systems. Procedures 5A and 5B also analyzes these critical maintenance metrics, and additionally incorporates Maintenance Groups to define your replacement and reassembly process. 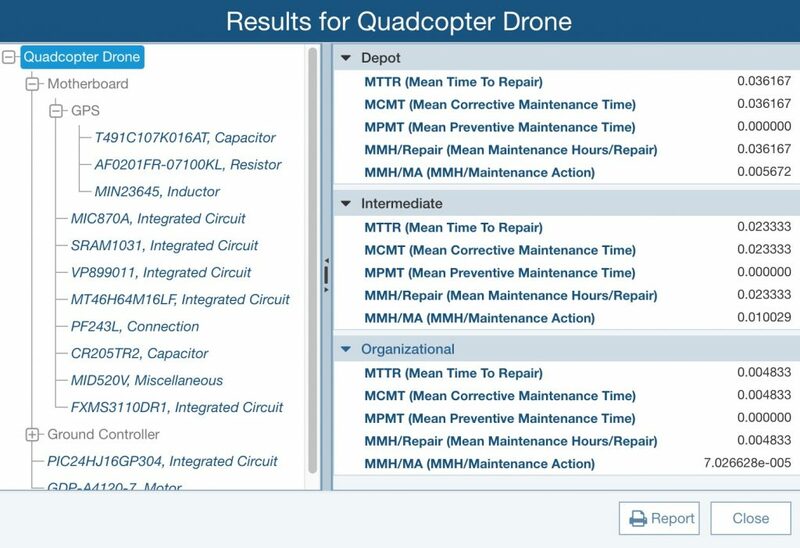 Relyence Maintainability Prediction supports MIL-HDBK-472 Procedures 2 and 5, including the ability to define your Maintenance Groups information. Relyence Maintainability Prediction seamlessly integrates with Relyence Reliability Prediction to obtain failure rate information. Two metrics that are taken into account when performing Maintainability Prediction calculations are repair times and failure rates. You can specify your items’ failure rates directly from within Relyence Maintainability Prediction, or you can use the failure rates calculated in your Relyence Reliability Prediction analysis. If you are using both Relyence Reliability Prediction and Relyence Maintainability Prediction, the failure rates are seamlessly integrated into your Maintainability Prediction analysis. This integration means that your prediction analyses are more efficient, as well as more accurate. Relyence Maintainability Prediction has a fully customizable and flexible report generator for viewing your maintenance and repair metrics. You can also generate reports of all your repair input data. Both the analytical result outputs and input data reports can be exported to a variety of formats if needed. Additionally, Relyence Maintainability Prediction enables you to compute your results at any or all of your maintenance levels. You can review all the metrics in the easy to navigate results viewer, and can also include them in your reports. Relyence Maintainability Prediction enables you to review your metrics in an easy to navigate viewer, and also generates complete reports.